Think tanks, non-profits and research organisations put a lot of effort, energy and money into producing research papers that inform their audiences and advance their sector. However, as soon as it is put out into the world, it is easy for this effort to go to waste. When research is launched at an expo, an event, or published online it becomes one of many available for audiences to read. So the question is, how do you make it stand out? Design can be considered an unnecessary addition; an extra expense to be taken out of an already over-stretched budget to add on ‘decoration’ that will get in the way of intelligent content. This can be the case if design is used purely superficially. However, if design is rooted in insight and design is developed with context and audience in mind, it can be used to communicate and reinforce research. And in doing so, help it gain attention and start conversations. The Overseas Development Institute (ODI) wrote a series of research papers explaining the relationship between migration and critical development issues that are central to the UN Sustainable Development Goals. They wanted to make policymakers and governments aware of their work. However they were launching their research at the UN General Assembly, presenting their work alongside an overwhelming number of other organisations. 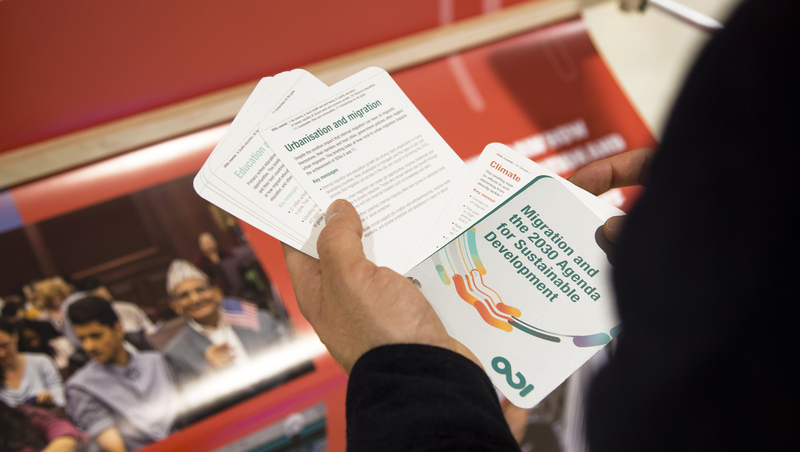 We worked with ODI to understand what is at the core of migration; the continual movement of people. Building on the existing ODI brand, we created a visual device to represent this circular movement. Creating such a device enabled ODI to give its research a visual identity and would mean it could connect different parts of its work whilst staying true to the ODI brand. Once ODI had a visual device and some creative principles in place (relating to circularity and movement), they could look at unique ways to frame their findings, both at the Assembly and online. Based on insight around behaviours at UNGA, we worked with ODI to experiment with printed formats that would create interest. We moved the majority of written content to downloadable PDFs. This allowed them to create an easy-to-navigate fan-deck containing key facts. Policymakers could browse through the fan-deck by theme or SDG, and easily understand if they wanted to learn more on the subject. 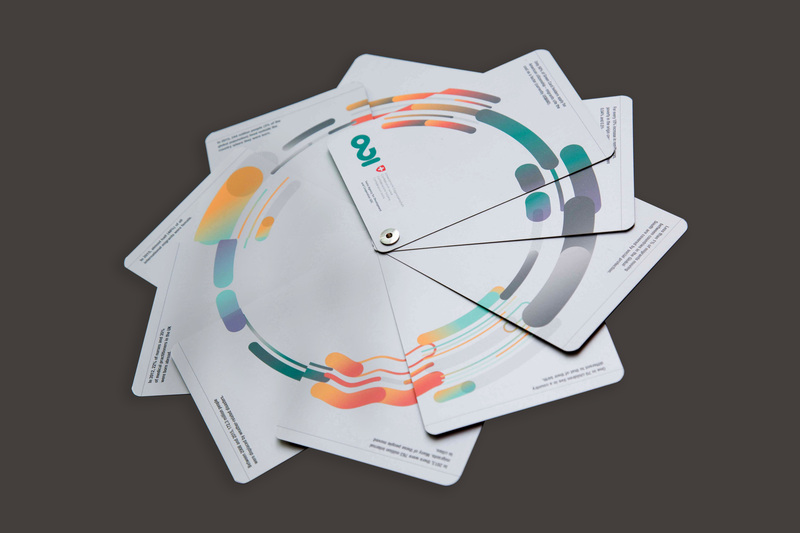 Importantly, for catching attention at the event, we designed the back of the swatch cards to gradually reveal a circle as the fan-deck was opened. ODI’s fan-deck resulted in much greater visibility at the 72nd UNGA. Attendees spoke about “the circular research report” and the “the talk with the circle in it”, spreading word around the event. On top of this, the full research paper downloads increased significantly and were shared by influencers in the sector. 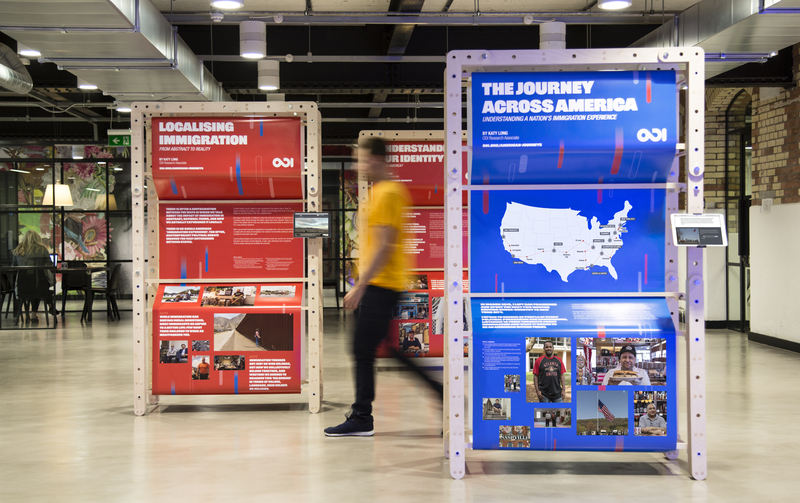 Beyond UNGA, the visual device has allowed ODI to add new pieces of research to the same family in a consistent way, and also create spin-off engagement formats such as a travelling exhibition inspired by the same visual language. Pick out your core insights: go back to your content. What is the core thing that needs to be understood? Is there something surprising about it? Something that is often overlooked? Something that makes your research unique? Balance understanding content with aesthetics: design doesn’t have to mean sacrificing content. Digital allows for content to exist separately to the physical format, or design can be integrated into longer-form research papers. Rethink traditional formats: just because something has always been done one way, doesn’t mean it can’t be changed. However, try to remain close to the boundaries of what your audience will understand so you don’t overwhelm them with complex systems. In summary, harnessing creativity can be vital to cutting through what can be a homogenous area. Use design well and it can help your organisation to stand out against competitors and enable you to frame your findings in a new way, both at events and in online resources. Go beyond what people expect and you can capture their attention…ensuring your research has the impact and influence it deserves.